Welcoming 1 Muharram (Islamic new year) that falls on Thursday (10/13), a grand parade will be done in Tidung Island, South Seribu Islands, Seribu Islands. 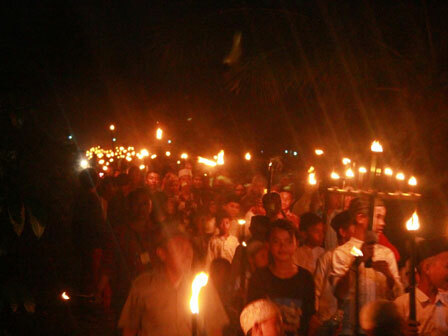 "We welcome resident’s initiative who wants to celebrate Islamic new year "
Head of Tidung Island Urban Village, Masud Hamid stated the parade will involve 2,000 participants. “ We welcome resident’s initiative who wants to celebrate Islamic new year ,” he uttered, Tuesday (10/6). Meanwhile, Committee Chairman of Islamic New Year Celebration, Bahtiaroni mentioned the participants are ranging from early childhood education center (PAUD), Elementary to Senior/Vocational High School level, Karang Taruna Youth Group, RT/RW and Majelis Taklim (Islamic study group). "On that occasion, is also celebrating Lebaran Yatim,” he fnished.